In the photos: members enjoy the entertainment provided by Sherry Vosburgh and Sheila Fordham, sing carols and try to answer the quiz questions! The winning team displays its prize. On Sunday 13 December 2009 25 members of the group met for lunch at the Brussels restaurant "L'Epéron d'Or" which is an old acquaintance of our group's as we have met there several times. The atmosphere of the restaurant, which is furnished in an old style, fits very well with the spirit of the Brontë group. The meal was delicious and tasty but on this occasion, the guests were regaled not only with the food but also with the surprise entertainment by Sheila Fordham and Sherry Vosburgh. The former delighted us with a poem written by her and inspired by the Brontës' Christmas day (see below), and the latter sang rousing Swedish and English carols. We all did our best to sing along! Also this year, we had an entertaining quiz on the Brontës' lives and works and an invitation from Franklin, who is to have an exhibition at the Parsonage Museum in 2011, to visit his studio to view his work. It was a delightful meeting with which to close the group activities in 2009. No footstep on the hill. And Branwell had been at the sherry! And lo - but hark - what sound is this? At the door a sudden knocking. As he was hanging up his stocking. The girl a wild eyed scamp. 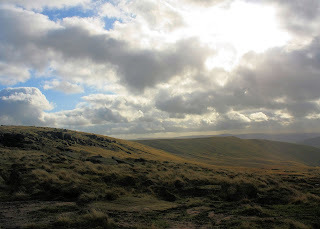 O'er moor and heath and stile?" The heather, the rocks, the sky". And 't foaming tankard of beer". You hurry back to hearth and home". He said "Christmas Eve - what rot!" Whence they came, whither they go? As she took up her quill. Franklin first made contact with our group earlier this year when he came to one of our events and told me about his fervent interest in the Brontës, dating back to his childhood. His fascination with the whole Brontë family has led him to scour second-hand bookshops in Brussels for books about them. He has also been working for years on a series of drawings inspired by their lives and works. His drawings are fascinating for their symbolism and vision of the Brontës' imaginative, spiritual world. Like the Brontës, he works on a small scale (though not quite as small as that of their minuscule manuscripts! ), with intricate detail painstakingly and patiently built up, one small drawing often taking months to complete. For years Franklin's dream has been to exhibit his pictures in Haworth to be seen by as many Brontë enthusiasts as possible in the place that inspired them. As a result of his contact with our group, he travelled to Haworth (his first trip to the UK) to show his work to the staff at the Brontë Parsonage Museum. His mission was successful and they have agreed that he is to have an exhibition there in 2011. Franklin writes: For many years now and ever since I can remember I have been interested in the Brontës, individually and as a family, their spiritual world and their art work which is a fascinating one and unique in the history of art of our western world. Throughout the years in my work as an artist I have been developing a project with a series of drawings and collages intuitively inspired by poems, letters, books, lives of the Brontës and now I am pleased to say that an exhibition of the collection will take place at the Parsonage Museum in Haworth in the year 2011. I am grateful to Helen MacEwan of the Brussels Brontë Group for her help in liaising and to Jenna Holmes of the Brontë Parsonage Museum for her warm welcome in the Parsonage and interest in a future collaboration for this exhibition. The drawings to be presented at the exhibition were patiently and thoroughly worked in detail for quite an amount of time. Thornfield Hall (size 42x30 cm) took 8 months to complete. The Kingdom of Gondal (25x19 cm) took 6 months, and there are more to follow and for the moment I am working on a homage to Branwell Brontë. In the Brontës' works, the atmosphere of torment (in my interpretation), solitude and agitation and maybe a feeling of 'moor and mind confounded' flames with intensity to an almost divine state of mind while, in my opinion, struggling hard and with great effort to stay human. This and the atmosphere of light, hard to capture in its essence, I tried very hard to bring out in these pictures. In all my art work, solitude and strong concentration on detail are vital to accomplish what the work demands. I hope that some of you will be able to see the exhibition in Haworth in 2011. In the meantime, all Brussels Brontë Group / Brontë Society members are very welcome to come and see the pictures in my studio in Brussels. On November 17, several members of the Brontë Group attended a very interesting talk organized by the Midis de la Poésie at the Musées Royaux des Beaux Arts in Brussels. It was entitled Ecriture et Imaginaire chez les Brontës. Dominique Jean, professor of English literature, translator and director of the Pléiade editions of the Brontës had come over from Paris on the occasion of the publishing of the second volume dedicated to the works of the Brontës in that prestigious collection. It contains a new translation of Jane Eyre and a translation of the Juvenilia. After briefly introducing the Brontë family in the setting of Haworth, Dominique Jean outlined the genesis of the literary production of this exceptional family. He told a large audience how a box of wooden soldiers offered to Branwell by Mr Brontë excited the imagination of the children and triggered the creation of an increasingly elaborate set of stories that they first acted out in plays and later recorded in a series of miniature book-length manuscripts, composed for the most part by Charlotte and Branwell. The lecture was illustrated by readings of extracts from the juvenilia and more conventional pieces by Annette Brodkom, a very talented reader. The lecturer showed the different strategies implemented by each of the four authors to convey his/her perception of the world with words. I was also struck by one poem describing a landscape closed up by mountains and scattered with rocks, in complete contrast to the open moors of Haworth. Therefore, a very interesting lecture that gave me food for thought and a new vision of some of the texts.